I am not sure if you can help me…. however I found part of an article on the boat that my Uncle went down on in February 1975 the 20th … anyway….. I was hoping that you may have a picture of this boat…. or coast guard search records….. I remember very well the night your Uncle was lost. I was in town (Kodiak) and can still hear the clanging of buoys heading out toward Hanin Rocks where the boat broke up.The boat was the Marten and a guy named Jeff Alexander was the sole survivor. It was a nasty snow storm that night and seas were awful. Sorry about your Uncle Jim…I probably would recognize him if I saw a picture. I’ll dig around and see if I can locate a picture of the boat. Kim, I have posted a photo of the Marten on the fishing losses of 1975 page. It was sent courtesy of one of the daughters of the owner of the Marten; now deceased. The daughters were very young when the boat was lost and remember the sadness. Wow, I’m so glad I found this page first while digging around looking for information regarding the Marten. I also had an uncle (Don McIlrath) that had worked on the same boat but had been sent back to Seattle due to an head injury and did not return because family concern. He never returned to Alaska, but I have lived here for a while and happen to work where there are many pictures of shipwrecks. I also have many questions because I am recording them all. For starts Epson,Martel Let’s chat! I was in Kodiak when the Marten was lost and knew some of the people involved. It was early in my commercial fishing career. I don’t have any records that I can find with the names Epson or Martel. Are they boat names? I knew all of the crew. Mike Rowe was one of my best friends. Jeff Alexander and Jim Rich had been at my house a time or two. Also Deer, who I seem to remember was from eastern Europe somewhere – maybe Albania. Mike was English. I remember Jeff (who is gone now too) as a big guy with fair curly hair and Jim as having dark hair and a beard. Deer was shorter. I lived on Spruce Cape at the time of the sinking and my house may have been just a mile from where they were lost. God bless them all. God bless all of us. I too worked a bit as a deck hand and it could have been any of us. I just found this website and was looking for info on the Marten because I could not recall the name of the boat, now I have it. I also lived there at the time of this tragedy. I remember your Uncle Jim very well, we were friends and he loved to give me a hard time. The night that the boat went down, the crew came into the Captain’s Keg, where I worked, to have pizza and a pitcher of beer before leaving. As CaptainGood said there was a bit of controversy around the sinking. As we at the Captain’s Keg seemed to have been the last ones to see them all before the shipped out, the Coast Guard came and interviewed me and my best friend Kyle who also worked there. All we could really confirm for them was that the guys had shared a pizza and one pitcher of beer between the four of them. They certainly were not inebriated, that amounted to one mug of been each. We all joked and kidded around as usual and they left. I don’t even think we knew they were planning to leave the dock as the weather was not the greatest. Your Uncle Jim was a sweetheart of a guy, with a great sense of humor. We always had a good time harassing each other! We were all devastated to hear the news the next morning, and that feeling has just never left me, as one of the worst losses during my years in Kodiak – about 1972 – 1981. I’m sorry for your loss, you lost a great one. 1989 was a rough year all the way around. I don’t have photos for alot of the losses but hope to get some that I can publish as time goes on. The people on alaska fishermen rip on facebook have been helpful sending in pictures with an “OK to publish”. I am members in some other Kodiak Fishermen groups that help as well. I will see what I can do. The boat your brother was on was the Hellion. They went missing while hauling gear after King Crab season on November 23, 1979. I was there working on the Elizabeth F in the same area. I have sent you the Seattle Times story with the particulars to your email address. RIP Aaron Going, Ron Hoffman and Walt Laughead. I am trying to find information about a crane barge on the beach near Yakataga. We landed on the beach nearby last summer and took photos. I’ve tried searching the internet with little success. I believe there were four barges that broke loose in a storm and the others may have been salvaged. Any information would be appreciated. I lost my uncle to the sea in 1985 in northern cailf. All hands. I canot find any records anywhere on this event. The boat was the Crescent Lady… Cptn Richard Senger out of Humbolt Bay. Lost somewhere around Half Moon Bay. How can I find records of this event? Sorry for your loss Mark. I couldn’t find anything in my archives, but they are mostly from wrecks further north than California. Your best bet would be to call the libraries near the Crescent Lady’s home port or near where she was lost. Find out if they have the newspapers from 1985. They usually have the originals or have them on microfilm. Some even have them digitized. Sometimes they will look up the event for you, but often you have to go there yourself and research it. Also the U S Coast Guard in that area would have records. Many records are being digitized and available on the internet through mostly Ancestry research sites. I checked for your Uncles name and the name of the boat at one of the larger ones (Geneology Bank) and wasn’t successful. Eventually they will be available. My husbands cousin was reported drowned from a boat in Alaska. The family wasn’t really close, but I’d still like him to be remembered. I didn’t see his name in any of your lists. His last name was Brauchli, I believe his first name was Andrew. It was sometime between 1985 and 2000 I believe. Even if his death was one of the alcohol related incidents or whatever, we would still like to know more. Thank you. Thank you for posting Michele. I have not found any record of your husband’s cousin but I will keep looking. We were losing many boats and crewmembers during the period you have described. The boom years of the crab industry were winding down and the joint venture fishing industry was becoming popular catching fish with trawls. Pollack, cod, mackerel, flounder and sole were being delivered to Japanese, Korean, Russian and other foreign processing ships. I was still active during most of those years and may have met Andrew. Do you have any idea of the fishery or vessel that he was involved in? A home port would be helpful as well. We will not forget him. Hello, does anybody know anything..anything..about the fishing vessel American Star*? Burned in January of 2000…I feel sorry,it was a nice vessel,and I wish to know more about her. The American Star was built in 1971 of steel, Length 93.6, Breadth 29, Depth 9, tonnage 191 gross, 132 net, call sign WYZ5579, Official Number D535675. She was lost January 29, 1990 on Otter Island in the Pribilofs. Her crew of 6 was rescued by a U S Coast Guard helicopter. I am not sure if any salvage was attempted. The only salvage operation in the area at the time was Magone Marine. Dan Magone sold the business recently but may still be around Dutch Harbor as an advisor. He would know. American star was owned by roger overa. Eric Anderson, Ryan westerndorf and buster the black lad were the only people I know that were on that one. Thanks Dylan. I will be adding in more modern wrecks and updating this site later this year. I was waiting for the Coast Guard findings on the Destination before posting it on here. Sorry for your loss. I have the Incident Reports from the Coast Guard and news releases on file for the American Star. Those reports state that skipper Roger Overa, 47; John Aure, 38; Eric Anderson, 38; and Ryan Westendorf, 22, all of Seattle; and Dan Staat, 38, from Moses Lake, Wash. were all rescued, along with a dog. It has taken me five or six years just to get the names of the 3,700 boats I have posted on here. I am now trying to go back and add in the new wrecks of the past 10 years and then additional information I have on all the ones I have posted. In addition to the research I am doing, my friend and associate Michael Burwell is sending me information about Alaska Shipwrecks faster than I can get it posted or published. It’s my pleasure and privilege to share. I’ve heard from Jeff Alexander’s nephew and daughter also. In fact my wife ran into Jeff’s nephew at the Alaska State Fair in Palmer, where we live now. Small world, yes? I would like to know any information on the ‘Pacific Trawler’ , which sank in 1982. My father owned this ship for many years, and at one time it was quite famous. I believed he owned the ship from 1955 until 1970 or so, and I’d like to know whatever I can about it. The PACIFIC TRAWLER was built in 1944 for the U S Navy at Whitestone New York as subchaser PCS-1382. After the WWII she was sold by the Navy and in 1955 was registered as the TUNA SHARK owned by Bernard M Reaves of San Francisco. From 1957 to 1960 she was owned by David Willard of San Francisco. From 1962 to 1963 she was owned by Wilepa Ocean Products of San Francisco and was renamed PACIFIC TRAWLER. In 1964 she was purchased by Louis Cecchi of Redwood City, California and registered at Juneau. In 1979 the PACIFIC TRAWLER was owned by Archie G Jorgensen and home ported in Juneau. She caught fire and sank in Prince William Sound near LaTouche Island July 23, 1982. I took a picture of this vessel in 1975 from the deck of one of the Alaska Marine Ferry System vessels as we traveled south and the PACIFIC TRAWLER was traveling north with a deck load of crab pots. I will email it to you. I hope this information is helpful. Thank you so very much. A sad ending for a once glorious ship. I found on a site something about the rescue of American Star, that it is featured in a discovery channel film.They intentionally sunk her in 2002, due to the lack of a buyer. If you watch deadliest catch season 1, at some point Sig starts talking about the St.Patrick, and her story.When they say she didn’t actually sank after the crew abandoned ship, if you look closely they show American Star without it’s wheelhouse, being towed away to Dutch Harbor.I have the screenshot of it but I can’t upload the picture…it’s pretty strange, hope you can help me find that Documentary,by the way, Dan Magone pulled her off the beach. I need your help. This is a link to the case of an unidentified body washed up in Hauula, Hawaii in November 1982. The remains were covered in marine growth, and he was wearing a Bayley exposure suit, which seems to have been mistaken for a dive suit. Given the length of time he must have been in the water, he could have gone overboard or abandoned ship in Alaska or the Pacific Northwest. The suit was bought in Tacoma. This fellow may have had his left arm amputated at some time prior to his death. He was about 5’9″ and may have had brown hair. Anyone know who he may have been? I was aware of the body found in 1982 in a Bayley Survival Suit but not that the lost arm was the result of an amputation. It could have been an accident suffered in a shipwreck prior to entry into the immersion suit. I hadn’t heard if an autopsy had been conducted or if any forensic evidence was still available. Do you know if there are any photographs of the remains? Any hair or other organics saved? The size and type of barnacles that were found on the decedent would have been an indication of the length of the drift. We lost many people back during the period prior to this body washing up on the beach in Hawaii. It takes about two years for a body to drift from Alaskan waters to Hawaiian waters. There were dozens of mariners lost in Alaskan waters that could have been the one found. The most notable mysteries that correspond with the drift time required were the 60 foot crab fishing vessel Hellion which disappeared near Unimak Pass November 23, 1979 with three fishermen aboard, the crab fishing vessel Norel disappeared March 17, 1980 in the Gulf of Alaska with three crewmembers aboard and the 75 foot trawler Commander disappeared in the Gulf of Alaska November 19, 1980 with four crewmen aboard. Also the person found in the Bayley suit in Hawaii was a young male in their 20’s wearing blue jean shorts which is something that is unlikely in the Alaska Fleet. It is possible that Barnacle Bob maybe either Clifford Stigall or Charles Partlett off the F/V St. Patrick. They abandoned ship in a storm off Kodiak on 11/29/1981. Both were wearing Bayley exposure suits. Stigall had an injury to his maxilla consistent with this description. Drift time would only be 355 days, but if some of their surviving family members could be found, they ought at least to be ruled out. I know the above because I’m one of the 2 survivors. Barnacle Bob is a case that has stuck in my craw since I heard about him. I believe the drift time from outside of Marmot Island in the Alaska Current around to join the North Pacific Current and then around to Hawaii would be 24 months or so, but I am no expert. There is an interesting article available called “Nike Trainers and Rubber Ducks” that details research done when a ship called the Hansa Carrier lost a number of containers overboard in a storm in May of 1990. Someone tracked the drift of the floating Nike trainers from the loss site in the North Pacific. Around New Years of 1991 they began washing up along the coast of Washington, Oregon and British Columbia. In the summer of 1992 some began showing up in Hawaii. I can send you a copy of that article if you would like. I was fishing in the area where you guys got in trouble from 1976 to about 1985. We knocked our windows out in the late 1970’s coming off of Portlock Bank headed into Marmot Bay. Would love to chat. If you email me at warren@alaskashipwreck.com maybe we can talk. Thank you Capt. Good. I’ll be in touch soon. Thank you so much. I will keep in touch on Barnacle Bob. I cannot post on WebSleuths website for some reason, so if anyone from over there wants to contact me and work on finding surviving next of kin for Stigall or Parlett, Facebook is a good avenue — I’m Wallace R. Thomas over there. Hello Wally, thanks for posting. I posted info about this decedent several years ago on this site hoping that it might jog someone’s memory and generate a lead. We have no DNA on Barnacle Bob, but dentals do exist. TV shows notwithstanding, more IDs are made with dentals anyway. If someone knows if these men were service members, or can put me in touch with relatives, perhaps progress could be made rather quickly, if dental records exist. I tried to reply earlier but it did not display. If you are in touch with relatives of these two men, I would hope they might have or know where to find dental records. The owner of the ship might also have records showing purchase of that Bailey suit. We may yet give Barnacle Bill (or Bob) his correct name . I am not in touch with either the Stigall or Parlett families. I have a number of leads to them however and I would be glad to share the work of finding them. I am 100% certain Parlett & Stigall were in Bayley suits as I was in a Bayley suit that I retained for about 5 years after the incident. Bailey is also my wife’s maiden name and I often noted the similarity between the girl I love and the suit that saved my life. Not something one forgets or confuses. The Medical Examiner’s data is a close match especially to Stigall – height correct, brown hair, and especially the noted trauma to the maxilla and missing teeth. I cannot account for the missing arm though. Capt. Good, you have my permission to give Ed Festor my email and phone number. Ed, I’ll share all my leads to family members and we can share the work, if you are willing. Thanks Wally. I wish we knew the serial number of your old Bayley suit, if it was close to BB’s suit that would be a good hint. I doubt that BB is either one, because of the time interval, but we could at least rule out the second man if we could find dentals. I’d be glad to divide labor up on this. Anyone know who sold Bayley suits in Tacoma Washington in 1979-80? I connected with Clifford Stigall’s brother. He recalled the case of Barnacle Bill and reported to me dental records were compared at the time and were NOT a match. I am still seeking Parlett’s family. You can contact me directly at warren@alaskashipwreck.com and we can compare notes. Thank you for you interest in this unsolved case. Thanks so much for your prompt reply, Captain. I attach a link to more info on the case. Apparently there was not a sufficient sample to get good DNA, and samples were not preserved. I am betting they said that the amputation was possibly antemortem due to new bone growth but I don’t know. I agree that the blue jean shorts sound like a warmer climate than Alaska but given the currents that is the farthest origination point that made sense so we start there. The exposure suit was purchased in Tacoma, making that area more likely. The suit was made in 1979 and he washed up in late 82, so there is a known interval of time for the accident. I have not seen an estimate for the length of time he was in the water. I have not seen any photographs of the remains but if they turn up I will share them. With no print, no DNA, and incomplete dentals, the best chance of identification is probably the suit. I am going to leave these links on here so anyone who reads this can follow up. Also for understanding how a mariner lost in Alaska can end up in Hawaii I would recommend looking up the story of the Hansa Carrier container ship accident of 1990. Briefly, a storm in the southern waters of Alaska knocked a group of containers into the North Pacific and some broke open. They were full of Nike Trainers and Boots. The footwear entered the currents in the southern Alaska Stream and some transferred into the northern “Japanese Current”. Eight months later the shoes began showing up on beaches on Vancouver Island and subsequently down the coast to Washington and Oregon. Two years later they began showing up in Hawaii. The entire drift activity was monitored by scientists to better understand the surface drift patterns of the North Pacific. Well, we are making some progress. With Capt. Warren Good’s info, we were able to develop an initial list of 18 possible individuals from 6 different vessels. We’ve been able to remove one already as Alaska State Troopers case file shows he was later found — that’s Chuck Parlett off the St. Patrick. We are in contact with the families of 2 other individuals and are putting them in touch with the Alaska State Troopers Missing Persons Program which will do DNA profiles. It’s a long process and it starts with the parents or siblings stepping forward first putting DNA on file before Hawaii authorities with attempt to profile Barnacle Bill/Bob. So, 2 out of 17 now in process. We urgently need to find the other families so we can put them in touch with AST Missing Persons. I do not have posting rights on Websleuths, so I hope someone who does will post this information over there. Hello Wally and thanks. I posted your info on Websleuths. B.B. unfortunately does not have DNA in the system. If anyone could find out who sold that Bayley suit in Tacoma-and the number of places that sold them must have been small- we could know who bought it and have a good idea who he was. It was pretty new when B.B. used it. The KOMONews.com from 11/22/2015 reports the Bayley survival suite was sold by the “old Tacoma Marine Supply” now closed. The reporter for KOMO News spoke with Don Jacobsen, the son of the man who owned the Marine Supply. The records of the purchase seem to be unavailable. I attempt to contact Lindsey Cohen through KOMO and found he/she had left their employ about a year ago. KOMO was unable or unwilling (understandably based on my cold call) to provide contact information to Cohen for me. Seattle / Tacoma is a very common source of supply for the Alaska fisheries and many who fish Alaska waters live or are based in Seattle area. I am actively seeking surviving family from the Hellion, Norel, Gemini, Commander & Cory P. and I’d sure like to get the word out in the Seattle area in an appropriate way. If dental records can be located that would be most helpful and DNA profiles of closest living relatives may also lead to BB’s identity. Thanks Wally. I posted your latest message on Websleuths. Did Bayley suits have a warranty card that the buyer sent in to the factory? Might let us know who bought it. Grasping at straws here, but that’s all we have to grasp at. No DNA, no prints, only dentals and that suit. We do know that B.B. met with fate in a relatively narrow interval of time between the suit manufacture and his discovery. His suit was pretty new when he used it. That reporter has a Facebook page. I think she is still in the Seattle area. I forgot to mention that dentals for B.B. ARE available, so if families of the missing have access to them please notify the authorities in Hawaii. They can be compared relatively quickly. Thanks to all on this board for their help. Thanks Ed. I’m sending her a PM. Could you let “Nancy Drew RN” on Websleuths know that Clifford Stigall is still a potential match and his sibling’s DNA is being profiled by the Alaska State Troopers Missing Persons Program. Todd Stallings was not wearing a survival suit when he abandoned ship, only a life jacket. He perished a few feet away from me so I know he is not Barnacle Bill. Aaron Goin from the Hellion is also has a relatives’ DNA being worked up by the Troopers. Keep in touch. Wally Thomas. I posted this entry on Websleuths in “Nancy Drew RN” for you Wally. I am a member of that group but have not participated in many discussions. I’ve been very busy with work and other obligations these past weeks but I am checking in and continuing to work the case. If you or Ed Festor check on Websleuths, you might let Nancy Drew RN and the group over know that the Alaska State Troopers Missing Persons Clearinghouse told me that the Honolulu County Medical Examiner informed them that some tissue samples from Barnacle Bill were preserved or least the file indicated that. We are all hopeful that these samples can be located and DNA extracted once the 2 profiles now being worked become available. Still a number of months, 6 to 12, probably before we know more. Prayers for all the survivors. I’m visiting Kodiak August 3 -5 and will see the Memorial and check in with the folks at the Maritime Museum as well as other friends. Best regards. Good to hear from you. I hope to get back to Kodiak one of these days myself. I envy you the opportunity. Among other things, I want to get pictures of the Fishermen’s Memorial with all the names to post over on Alaska Fishermen RIP on Facebook . Thanks again for all you are doing. If there is anything I can do to assist you in your efforts, please let me know. Well, sad news. DNA family-provided profiles for Clifford Stigall off St. Patrick and Aaron Goin off Helion have been completed and posted to NAMUS. I called my contact at Alaska State Troopers Missing Persons today and asked that she contact Hawaii one more time to see if any samples from Barnacle Bill had been preserved. We were told last year a thumb had been kept. But, Hawaii is unable to find it. That is word today back from Honolulu Medical Examiner to Alaska State Troopers. I remain convinced that Barnacle Bill is Clifford Stigall. I may wrong of course. He is someone and it’s a certainty he is an Alaskan or West Coast Fisherman. We seem to be at a dead end without long gone dental records. If anyone has ideas on how to proceed, please let know. Thank you for your continued efforts and the update. There is not a day goes by I do not think about this ongoing effort. Thanks. I see “Magnum P.E.” has posted over on Websleuths. That’s good. I’m going to pursue drift studies / drift computer simulations. They will never be 100% conclusive, but may shed some further light on Barnacle Bob. Thank you for keeping the records and this wonderful memorial going. Please give Ed Festor my best. We have a really neat old black and white picture of a boat called Deep Sea. I have been told that my father her in law took the picture in the 60’s around Valdez. 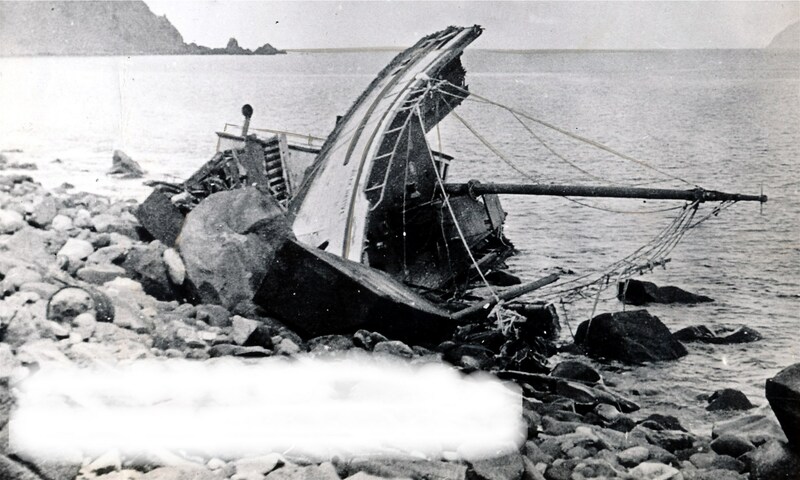 I found on your site where a boat called the Deep Sea was lost on August 26, 1976 and I wonder if the picture I have is of that boat where 8 people lost their lives. I am wondering if you might possibly have a picture of the Deep Sea. I would be happy to share the picture I have. Thank you! Evan McKernon contacted me from that organization back in October and I sent him a list of names of persons lost at sea in Alaska. All I have is the article about the loss that appeared in the Seattle Times in November of 1973. They did not mention Douglas Reef so that information is new to me. According to the 1965 List of Merchant Vessels, the Sunde was 96 gross and 65 Net Tons, Length 72.7, Breadth 18.8, Depth 8.7, Built at Seattle 1934, 180 HP Diesel, Service Freight, Call Sign WB3396, Official Number 232911, Owner Howard White, Home Port Wrangell.